Run by Lisa Maurin. Lisa and me very much share the same ideals in rats as well as a strong friendship and working together is just logical step from that. 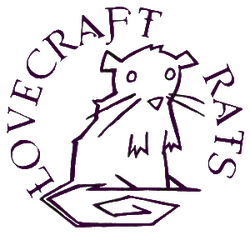 Lovecraft rats and Isamu rats are very much the same rats, just born in a different house. Her website has lots of lovely photo's and some really interesting statistics, such as baby weights as they grow. She also has a facebook group where you can see more litter photos and such. Below are links to other breeders who I personally recommend. They work in part with the same Tabi rat lines, but also with there own lines too. I would (and in many cases have) happily own rats from these breeders. Breeding for health, temperament and longevity in Russian blue based colours, agouti and black, Essex markings and unmarked. Run by Lloyd Adlington. The most Southerly member of the TI with plenty of lovely ratty pictures and examples of good cage set up. Zephyr Rats - Based in Cambridgshire Zephyr breeds for american minks and american cinnamons, and in doing so, will also have blacks and agoutis, some will be dumbo. Their secondary line is aimed towards platinum agoutis. Lilliput breeds for rats in various colours and markings and are also committed to providing for rats in need so will, from time to time, have various rescue rats available. Atlas aims to breed rats with exceptional temperament, health and show qualities in the russian blue, russian blue essex, russian dove and Russian dove essex varieties. Related varieties will often be available. Aim to breed rats with excellent temperaments, that live long healthy lives and are also beautiful to look at. In the varieties agouti, black, american cinnamon, american mink, russian blue agouti, russian blue, dove agouti and dove, some with the essex marking. This club is very much my home. It is based around the North of England but does occasionally have shows as far south as Cambridge. It aims to equally promote rats as pets and as show animals, providing lots of information on rat care and breeding as well as a lovely friendly atmosphere at shows. A large mainly UK based forum, with many active members and a wealth of advice and ideas. Also a thriving community for sharing stories, pictures and chat. There are several online businesses out there that I regularly use and would recommend to others, or that I know well and would use if I was based in the right area. Custom Canine Care - personalised services for you, your dogs and your other household pets based in Newcastle. Run by Alison Campbell of Shunamite Rats. I only wish I lived nearer and I would very quickly own dogs with support from CCC. Rat Rations - providers of virtually any rat food related product as well as a lot of toys, bedding, substrate and even cages now. I will admit this is the rat site I shop at more than any other.